Shark Buck a step down converter. The Shark Buck is the same diameter (0.75") as the Shark and Blue Shark. As long as Vin is higher than Vout you can use multiple LEDs in series on the output as long as the total Vf is less than the input voltage. It has the same trim pot and trim pot functionality. Remora can be mounted on the Shark Buck and behave the same as the regular Shark . It will be a little taller. The Shark Buck has reverse battery protection and accommodates the same copper C as on the regular Shark for optimum thermal transfer to the heat sink. There are two sense resistors on this board making it easier to generate a valid output current combination. 0.1 / Rsense = MAX_CURRENT. Two 0.1 ohm resistors or one 0.05 resistor= 2A max. 1) sum up the Vf of all the series LEDs. 2) Based on the battery technology and number of batteries determine the low and high battery voltage. 3) For a boost the low and high must be less than the sum of Vf. For a buck the low and high must always be higher than the sum of Vfs. To thermally bond Blue Shark or Shark Buck to a heat sink, use a super thin (paper thin or thinner) layer of thermal glue. When mounting a Blue Shark, Shark Buck etc to the heat sink use an ultra-thin layer of adhesive for maximum conductivity. Too thick of a layer is like creating an air gap. For proper mounting the converter board should be clamped. Thermal interface to heat sink must be less than 15C/W. Shark Buck Thread on Sandwich Shoppe Forum. These are a few Q & As but not all. Please read the thread. converter board. The trim pot input can also be PWM controlled via a microprocessor. Q: Does the Shark Buck run OK on one cell? I want to run an SST-50 with 2amps or better on a single 18650. A: No, the Shark Buck needs a couple of volts overhead to maintain regulation. With a large LED or multiple parallel LEDs with Vf of 3.5V or so requires 5+ volts for the Shark Buck. That would be min or the voltage of the discharge state of the batteries and a fresh cell setup would therefore be 6-8V. Q: Question regarding minimum voltage input. A: For a specific application you must always have Vin greater than Vf or the Buck converter will not be stepping down. If the P7 Vf is 3.5V then Vin must always be greater than 3.5V for A buck converter. 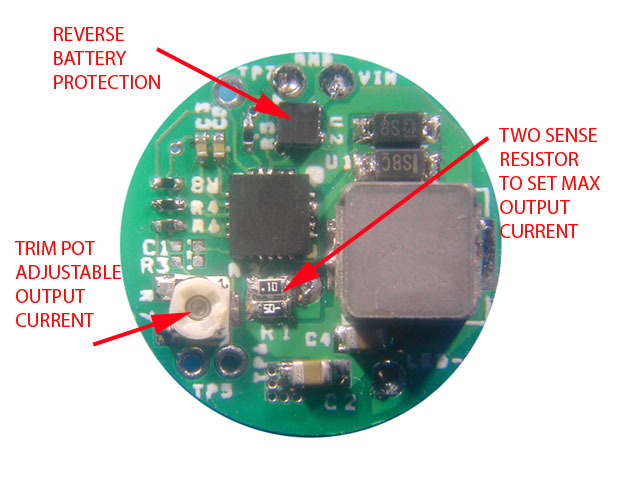 The buck regulator will fall out of regulation when Vin approaches ~20% over Vf or ~1.3V above 3.5V. For a 4 cell NiMH, Alkaline means you will maintain regulation for only a short period of time on high. After that it will fall into DD mode. The batteries under load will sag making Vin lower on high. A: Three LEDs with Vf of 3V is 9V in total. Remember take your batteries low and high Voltage. For a fresh li-ion that would be 4.2V and I don't know where you consider discharge is, but, let's say 2.5V. For three batteries that would be 7.5V to 12.6V. In order for the Shark buck to be in regulation all the time the complete battery range must be higher with margin in order to maintain regulation. Since 9V is not always less than 7.5V - 12.6V this situation is not optimum for full regulation all the time. It may be in regulation under fresh batteries conditions, but, will fall out of regulation at some point in time before the batteries are fully depleted. 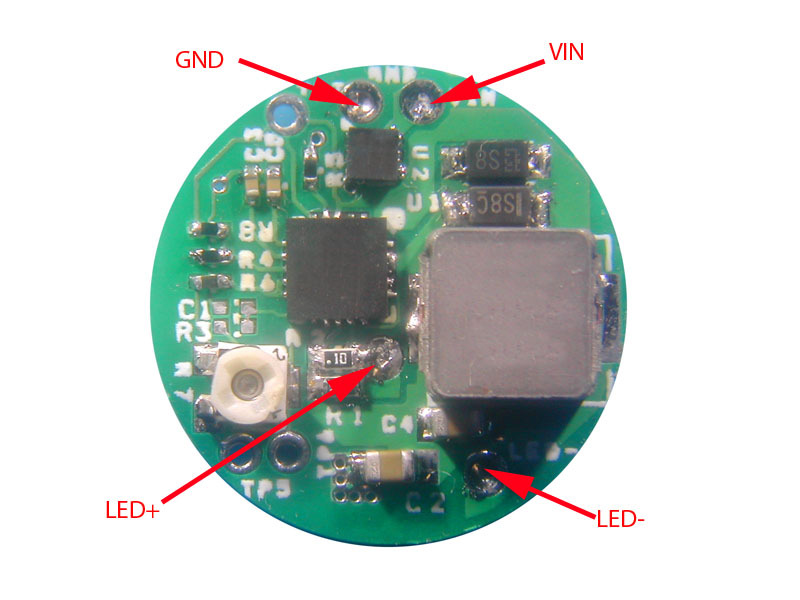 Good for running one or more high power LED in a step-down configuration.